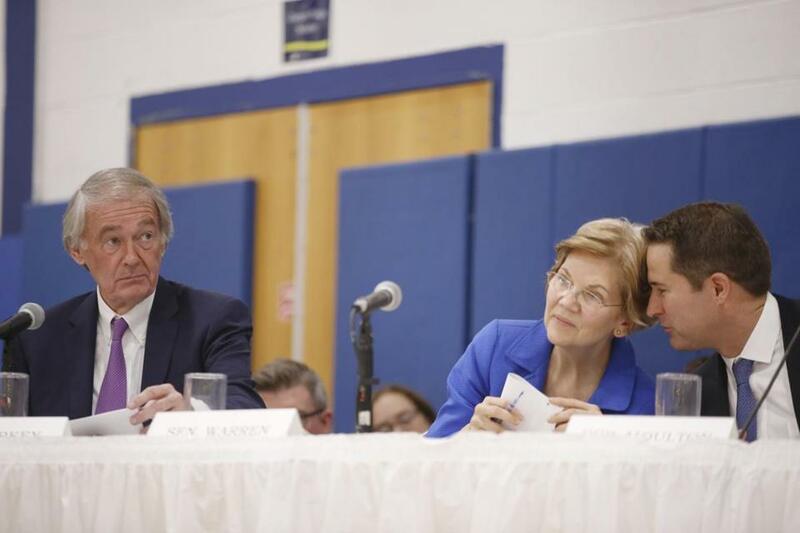 Representative Seth Moulton whispered into Senator Elizabeth Warren&apos;s ear as Senator Edward Markey listened to a statement from the panel of Columbia Gas representatives during the first hearing at Lawrence High School in November. Federal lawmakers from Massachusetts are criticizing Columbia Gas about backdated gas bills being sent to Merrimack Valley residents and a winter rate hike, months after explosions and fires rocked the region. The letter, signed by US Senators Edward J. Markey and Elizabeth Warren and US Representatives Lori Trahan and Seth Moulton, also pushes for the utility to “suspend any planned rate increases” in Lawrence, North Andover, and Andover, where fires and explosions ripped through homes and businesses served by Columbia Gas on Sept. 13. The disaster killed an 18-year-old, injured about two dozen others, and left thousands without heat and hot water. Moulton and Trahan represent the affected municipalities. Federal investigators pinpointed a Columbia Gas engineer with “limited knowledge” who erred in drafting work plans for a Lawrence construction site, which set the chain of events in motion. In a statement, a Columbia gas spokesman, Scott Ferson, said that customers whose natural gas appliances were not repaired or replaced and whose gas service was turned off as a precaution in the aftermath of Sept. 13 recently received gas bills for the first time since the fires. Those customers, according to the utility, received a full month’s “restoration credit” for any and all months in which they did not receive service for one or more days. Customers whose natural gas appliances were repaired or replaced will not be billed for gas service from the date of the catastrophe through the end of December, according to Ferson. Billing, he said, will resume this month, and such customers will receive their first bill next month, a bill that might include any balances that existed prior to Sept. 13. The Democratic lawmakers wrote that utility officials had indicated billing would resume in December, “but at the same time, assured our staff that customers would not receive sizeable retroactive bills with due dates in January.” Consumers are now receiving “large backdated bills,” they wrote. “We are especially disturbed by the reported lack of communication between your company and customers that would have alerted them that these backdated bills would be forthcoming or presented clear options to engage in deferred payment or payment plans over time,” read the letter. Ferson said no customer is in danger of having gas turned off, and the utility is offering “flexible payment options” with no late fees or service charges. Customers who are having problems paying their bills are encouraged to call a customer line at 1-866-388-3239. “Annual gas cost changes are a pass-through of gas costs,” Ferson said. “Columbia Gas passes on the cost of natural gas supplies to the customer without any markup or profit margin,” with state approval. Milton J. Valencia of the Globe staff and Globe correspondent Andrew Stanton contributed to this report. Danny McDonald can be reached at daniel.mcdonald@globe.com.